The online calculus course taught by Frank Bäuerle (left) and Anthony Tromba (right) is the first cross-campus online course that satisfies prerequisites at all nine UC undergraduate campuses. Brent Haddad teaches his water policy course live online via webcast. UC Santa Cruz faculty venturing into the brave new world of online education are finding that a well-designed online course can be more accessible, and may even provide a better educational experience for students, than some traditionally taught courses. This is especially true for courses that large numbers of students are required to take for their majors, such as calculus. The online calculus courses taught by UC Santa Cruz math faculty Frank Bäuerle and Anthony Tromba ("Calculus for Science, Engineering, and Mathematics," Math 19A & 19B) are now available to all UC students through the UC Online cross-campus enrollment system. They are the first such courses to have "articulation agreements" with all nine UC undergraduate campuses ensuring that they count as prerequisites and for general education requirements. Herbie Lee, vice provost for academic affairs, said he recently met two UCSC students who told him they were waiting to take calculus online because they had heard it was better than the traditional course. "It's a great course. Their concept from the beginning was to create a great calculus course and do it online," Lee said. "It's actually more interactive, with more active learning by the students, than when they're sitting in a lecture hall." Tromba, a professor of mathematics, said the course's online discussion forums are especially good for students who are insecure about asking questions in class. Students at UC Santa Cruz also have access to in-person discussion sections, but any student can post questions anonymously online and get responses from faculty and teaching assistants. Other students often respond to questions as well, with instructors providing guidance and amplification. "I have never seen such a degree of interaction between TAs, faculty, and students," Tromba said. "It's a historic transformation." The online lectures also offer advantages for many students because they can stop and replay any parts of the presentation they didn't understand. In developing their calculus course, Tromba and Bäuerle worked with Katrina Fullman, an instructional designer at the UC Office of the President (UCOP), to create the online lectures and interactive course materials. UC Santa Cruz now has an instructional designer on staff, Aaron Zachmeier, who will be working with Tromba and Bäuerle on a new "Vector Calculus" course. 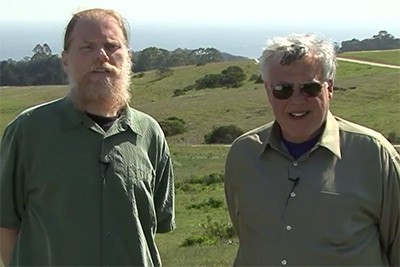 Zachmeier has also been working with several other UCSC faculty to develop new online courses. "Geology of the National Parks," for example, was developed by Susan Schwartz at UC Santa Cruz, Jeffrey Gee at UC San Diego, and David Osleger at UC Davis. This spring, they taught the online class separately to students on their respective campuses. Next year, it will be open to all UC students through UC Online and taught each quarter by one of the faculty collaborators. Schwartz, a professor of Earth and planetary sciences, will teach it winter quarter. According to Schwartz, funding from the UCOP Innovative Learning Technology Initiative was crucial, because developing a good online course takes a lot of time and effort. She was able to hire a graduate student, Erin Todd, to work on the course with her, and instructional designers at Davis and Santa Cruz worked with the instructors to take full advantage of online technology. "I saw it as a chance to put together a really good class and see what happens," Schwartz said. 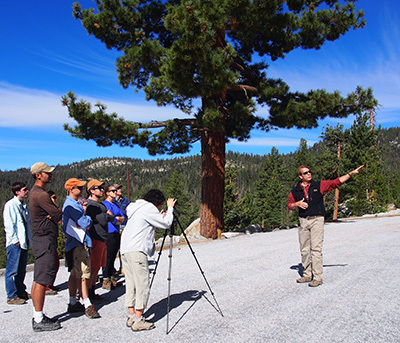 The instructors traveled to Crater Lake, Lassen, Yosemite, and other national parks to record lectures in the field. They also incorporated animations of geological processes, Google Earth images, and other visual elements into the lectures. "We would use those in a traditional class too, but in the online lectures you can seamlessly integrate a lot of animations and video clips," Schwartz said. "The nice thing is it's professionally edited, but it would be hard for faculty to do this without support. I believe in online education, but not if you just film a lecture in a classroom and put it online." Like Tromba, Schwartz said she felt she was able to have good interactions with students online. But she found that relatively few students were taking advantage of the online office hours. "We may have to make it required at least once so they see how it works, because the students who did engage online really liked it," she said. 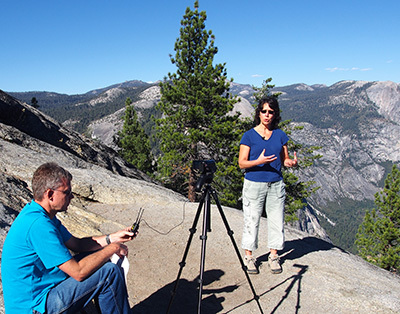 Other online courses currently being developed at UC Santa Cruz include "Ecosystems of California" taught by Erika Zavaleta, professor of environmental studies; and a new online Writing 2 course taught by writing program lecturer Lené Whitley-Putz. According to Associate Vice Provost Lee, the UCOP program provides grants of $50,000 to $100,000 to support online course development, and UCSC faculty have had good success getting those grants. "Online courses are expensive to produce, so it's not a way to save money," he said. "It's about improving the quality of the educational experience. This is a good opportunity for faculty who are interested." When it's done right, Lee said, the benefits of online courses include a more interactive learning experience; the ability to integrate more types of material into courses; and the flexibility of the online format to suit different styles of learning. The online format can be especially helpful for students with learning disabilities, said Rick Gubash, director of the UCSC Disability Resource Center. "Any time students can replay information to capture something they missed can be really useful," he said. Gubash said designing online courses to be universally accessible can be helpful for all students. Captioning of lectures, for example, not only makes the content accessible to deaf students, it also helps students who find visual information easier to process than speech. "I'm excited about the opportunity to take accessibility into account from the beginning in designing online courses," Gubash said. "It will be better for all learners, and can eliminate the need for accommodations after the course is designed." Not all online courses involve prerecorded lectures. 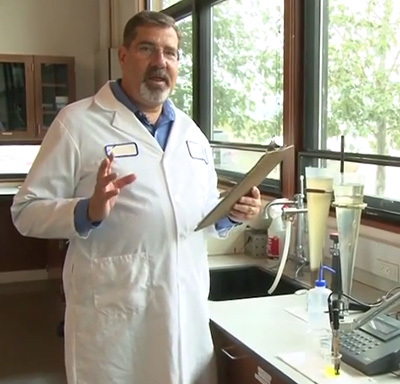 The first UCSC course offered through UC Online to all UC students was a course on water policy taught by Brent Haddad, professor of environmental studies and technology management. Haddad delivers his lectures live online via webcam, which allows him to answer questions and interact with students during the lectures. Each lecture is recorded and posted online, however, so students are still able to review any material they might have missed, and Haddad also posts pre-recorded supplementary material. According to Haddad, remote access to online courses is a big advantage, even with live lectures. "I've had students from Korea, Russia, the East Coast, and throughout California take the class, and some of them provide really interesting perspectives," he said. "It's also straightforward for me to integrate guest speakers who aren't in Santa Cruz, and I do that frequently, from as far away as Washington, D.C."
Tromba said his online calculus course has had students enrolled from across the UC system, as well as from China, Canada, and one from a boat in the Mediterranean. Of course, the interactions faculty have with students online are different from when they meet with students in person. Schwartz said she would not want to go online with the small, upper-division courses she teaches. For big classes, however, in which it's hard to engage with individual students in the lecture hall, the online format offers real advantages. "Some say they would still rather have a teacher in a classroom," Tromba said. "But it's a question of what you're comparing the online course to--a class in a very large lecture hall where students can't either read what the professor writes on the blackboard or clearly hear what he or she is saying? In the online environment, the visuals and audio are crystal clear. For every hour of lecture, we spend more than ten hours of preparation."